Food products packaged in hermetically sealed (air tight) containers are subject to regulations equivalent to the Code of Federal Regulations, Title 21, Parts 108, 113, and/or 114 (21 CFR 108, 113, and/or 114). Of course, all food products also must comply with a number of other regulations including labeling, net contents, good manufacturing practices, etc. Low acid foods have finished equilibrium pH greater than 4.6. Acid foods have a natural finished equilibrium pH of 4.6 or less. Acidified foods also have a finished equilibrium pH 4.6 or less but have a significant low acid component. 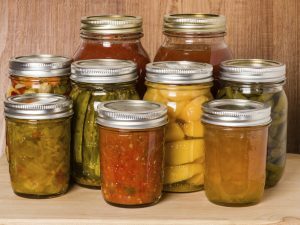 Acidified foods include pickled vegetables, most salsas, and many other formulated products. Exceptions to the acidified foods regulations include carbonated beverages, alcoholic beverages, refrigerated and frozen products, and products with water activity 0.85 or less. Jams and jellies which meet the published standards of identity are exempt since their water activities are 0.85 or less. A process authority (a person with expert knowledge in processing) determines the product classification and the processes for low acid and acidified foods. The rest of this document will address only acidified foods. Examination of raw materials, ingredients, and packaging materials. All mandatory records must be retained at a reasonably accessible location for at least 3 years from the date of manufacture. In addition, every processing facility which processes low acid and/or acidified food products must be registered with the FDA (FDA Form 2541). The official process for each product x container combination must also be filed (FDA Form 2541a). The regulations also include an education requirement. “All operators of processing and packaging systems for acidified food shall be under the operating supervision of a person who has attended a school approved by the Commissioner for giving instruction in food handling techniques, food protection principles, personal hygiene and plant sanitation, pH controls and critical factors in acidification, and who has been identified by that school as having satisfactorily completed the prescribed course of instruction (21 CFR 114.10).” WSU is an approved school and offers courses several times each year for as few as 6 students per time. Official processes for acidified foods include maximum pH as well as thermal processes. The thermal processes are often described as “hot fill/hold” or “hot water bath/steam bath” methods. Following are descriptions of each. Product is filled into the finished containers at a temperature high enough to assure that the temperature of all product in the container is at or above the minimum prescribed when the closure (lid) is applied. Container is then inverted (turned upside down) for 3 minutes and then may be cooled. If the product cannot be pumped, the hot fill/hold process probably is not applicable. Critical factors may include head space (consult with process authority). Product is filled into the finished container at convenient temperature and finished closure is applied. The higher the closing temperature, the better the finished vacuum. Filled, closed containers are then heated in a hot water bath or steam bath maintained at the prescribed minimum temperature for the prescribed time. This information is included in the process from your process authority. If you do not have that information, contact us immediately for assistance. Once the prescribed minimum process is completed, the containers of product may be cooled. We strongly recommend that producers of acidified food products purchase and properly use a digital pH meter and appropriate accurate calibrated thermometers. 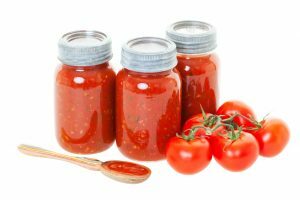 Producers of jams, jellies, preserves, fruit butters, spreads, syrups, and other similar products are strongly advised to purchase and utilize appropriate refractometers. Many consider these instruments to be expensive, but we believe they are necessary for reasonable operation of a profitable food business. Mail or deliver to Dr. Girish Ganjyal at the address provided above. Your name, company name, address, phone number, email, web address, and fax number. The jar size that will be sold. We ask two jars from each recipe. Recipe amounts in weights and percentages preferred before volume (we keep all recipes and processes strictly confidential) and label for your product. Download required excel spreadsheet template for product evaluation. We ask that you fill out the spreadsheet, fully. You must convert your recipe to either all ounces or all grams, and no mixing of two different weights. If any information is not filled out or incorrect, it may delay the evaluation process. Please send the amount for indicated services provided. If you send a check, please make the check out to Washington State University. When shipping, please pack each jar with bubble wrap and avoid having the glass jars touch each other during shipping. This will decrease chances of breakage during shipping. Any paperwork and check needs to be placed in a plastic sleeves or bags in case the product leaks or breaks. Product evaluation for potential safety issues, process classification, potential quality problems which might be associated with the product, etc. Timeline: Dr. Ganjyal will contact your within 5 weeks to discuss your results, after which a process authority letter will be mailed out to you. If you do not have the correct information, like filling out the recipe spreadsheet completely, it will delay the process. Jams, Jellies, Fruit Butter, Salsa, Salad Dressing, Garlic Spread, BBQ Sauce, Chutney, Teas, and Mustard. Baked Goods, Seasonings, Granola, Spices, and Cookies for water activity only, no PA letter. We do not analyze any fermented products or products which have not been thermally processed. Please note that we can only accept up to 5 different products/recipes for testing at a time. $100.00 each product/recipe in-state (WA/ID/MT). For example, if you want to test a blueberry jam, strawberry jam, and blackberry jam, they are three different products thus we ask you send a $300 or $450. Another example, if you have a salsa and you want to test the mild salsa, medium salsa, and extremely salsa. Those are considered three different recipes and we would ask you send a $300 or $450. Another example, if you have a salsa and you want to test pint glass jar, quart glass jar, and half gallon glass jar. Those are considered three different recipes, due to the processing, and we would ask you send a $300 or $450. Process determination with specified pH, process times/temperatures, and critical factors. Please note that we can only accept up to 3 different products/recipes for heat penetration testing at a time. $200.00 each product/recipe for in-state (WA/ID/MT). $225.00 each product/recipe for out-of-state.